What I call Costa Rica Army Ants are actually more like National Guard or Peace Corp ants or something along those lines. They’re smaller than the army ants of Africa, but they’re very aggressive and have a bite that hurts a lot – I’ve been told. But aside from their aggressive nature, they are helpful insects. 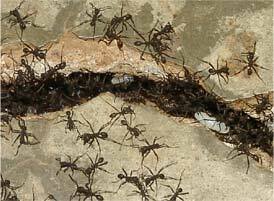 Technically they are indeed a type of army ant known as eciton ants, and the Ticos call them chutiya ants. What I am calling Costa Rica army ants here are also known as “cleaner ants” because they will clean your house of any insects they find in the nooks and crannies, then they leave ! This can take anywhere between a half an hour to several hours, but I am told they always leave before nightfall. They came here twice before to clean my house but I wouldn’t allow them in. The first time we didn’t know they were “good” ants. We just knew hundreds or thousands of ants were trying to get into our house and my experience was ants don’t usually leave your house once they come in, so we fought them off. It took my wife and me about 2 hours of spraying tons of poison around all sides of the house and directly on them as they marched. But we won. They finally left, defeated by modern chemicals. A few months later, they came again and this time I fought them off alone. They brought a bigger battalion this time. They we so aggressive, it was really like an Army in terms of how they attacked. 3 divisions advanced towards my house on 3 sides of the house at once… and I was running around back and forth, trying to kill them with mostly the garden hose full force at first; but after a couple hours of barely keeping them at bay, I got out the organic “poison” (tea tree and peppermint oil with vinegar) and when that didn’t work I resorted to chemical poison. I fought them non-stop, literally running around the house for 3-4 hours, and they would NOT give up! They kept climbing up the walls to try to get in from the roof area (which they can) and I was desperately hitting them down with the hose and then spraying poison around the bottom. But they had their “heroes” who’d go right through the poison or they’d fall down from the water then go right back up again. It was very literally like fighting off an army of ants – they knew how to ADVANCE against all weapons, they attacked from all sides, and they would not give up until their losses were becoming too great. After that, I decided “Next time”, I’ll just let them in!” I won the battles but they won the war! I was pulling out! Two days ago they were at our driveway gate and when I had to open the gate, they were underfoot and they were advancing on ME, and I had to quickly open the gate and get out of the way or it appeared they were going to crawl up my legs and bite me. Then, yesterday, I saw them half way down the driveway, heading in the direction of the house. But it was almost dark and I read that they don’t work after dark. So I am prepared to let them in the house if they come, next time. I asked my Tico friend. He said he doubted they would bite me in my bed, but they MIGHT. Better to get up and get out of bed! I didn’t want to set my alarm but I opened my curtain in the bedroom so the light would wake me up. When I had suddenly seen them on the porch last time, I saw how fast they move. I was sweeping the porch and just about done and I suddenly turned around and there they were – hundreds of them heading towards the door. That’s when I sprang into action against them. So I could see how I might be laying in bed staring at the ceiling and suddenly I might find a swarm of them on my body biting me! I was paranoid. I was imagining the ants attacking me. Then I thought, “These Costa Rica Army Ants are actually very smart. What if they remember me and now want REVENGE?” I know that’s a little crazy, right? Well hey, I was half asleep at that point and I had even had a dream about them. But I actually was worried they might bite me. One time in the United States as a child, I had about 40 bees sting me and it was no fun. So I don’t want to have a similar thing with army ant bites! So I didn’t sleep well and then got out of bed at 5:45am. Ugh. I hate getting up that early. I went outside to see if they were heading for the house or if they were still where I saw them last night right before sunset. They weren’t. I texted my friend that I hadn’t seen them yet and he said “Maybe they don’t work on Saturdays!” and we had a virtual laugh. The following video is one I found on youtube, it’s not my video nor my house! I’m actually hoping they do come now, because I don’t want to go through another night of worrying that they might come while I sleep. And I’m NOT getting up super early again tomorrow! I thought sure they’d come this morning. They were only about 75 yards away from the house when I saw them yesterday evening. I took a walk around again and I still don’t see them, so I guess they’re not coming or they’d have been here by now. So … I wait here, today, hoping they will come, because if they don’t I will go to bed again tonight wondering if they might come while I’m asleep. I will make a new post if they come, and post the link to it here on this page! By the way, I am told it is very unlikely these Costa Rica Army Ants would bite me in my sleep and are unlikely to mistake me for a giant insect! I just went through this tonight! I’m totally freaked out. How did you get them out of the house. They keep coming. We keep spraying. It’s awful. I can’t sleep either. My MIL put tp in her ears just in case they come into bed at Night. Yuk! What time did they come? Usually the normal “CLEANER ANTS” (not really “army ants” I found out after writing this post) come in the daytime and leave before dark. So it is recommended in that case that you do nothing, just let them come in and clean the insects out of your house, then leave of their own accord, usually within an hour or at least within a few hours. HOWEVER, I have heard from a Tico friend that there is a new type of “cleaner ants”, small ones, that come and yes they do come at night and so if you want to go to sleep I guess you may want to get rid of them before you go to bed. Doing so will have to involve poison in your home so I would recommend just trying to wait them out. It is *almost* certain they WILL leave of their own accord IF they are “cleaner ants”. I have not heard of any ants that invade in the same way (a long line of ants moving as if under command and seeking out insects to kill and eat there or carry back home) as cleaner ants which are NOT cleaner ants. If they are indeed cleaner ants they WILL move on, they will not stay in your house, according to everything I have heard. Will you please post back here and tell us what happened? Do you have pictures you could post? Contact me if you want and I will post any photos you have and let you tell your story here. 52 years old and they have come every year and they have never bit me on my bed or anything like that. Just keep out of their way and let them be. They do good work. God Bless them. Hi, and thanks for the comment. We have not poisoned any since those 1st 2 times. However my friend who says as you do, “don’t kill them” had a different kind of cleaner ants come to his house last year. They came in after dark around 10-11pm which he says the others never do, and they came in and started biting his dogs and were very aggressive so he had to poison them to get them out of the house as they needed to go to sleep. So I’m not sure it’s true that all cleaner ants won’t bite people. I’d have to see a scientific study on this before I’d be ready to believe it.